Advertising tracking firm Ace Metrix today shared its data on viewer reactions to Apple's new celebrity iPhone 4S ads featuring Siri and starring Samuel L. Jackson and Zooey Deschanel. The new ads are registering well with consumers, generating scores higher than any other iPhone 4S ad released so far this year. “Apple’s ads for iPhone had been falling rather flat earlier in the year, all scoring below the Apple iPhone norm of 620. This new creative tack that uses likeable celebrities struck a chord with American viewers,” said Peter Daboll, CEO of Ace Metrix. “These ads performed very well, especially with younger women, who did not react as strongly to Apple's more feature-focused ads from earlier in the year. Celebrity ads are risky, as many celebrities can be polarizing. In these latest ads, Apple has chosen wisely, using celebrities with broad appeal." But while the new celebrity iPhone 4S performed very well, they were unable to unseat Samsung's top Galaxy Note as the most popular mobile phone ad of 2012. 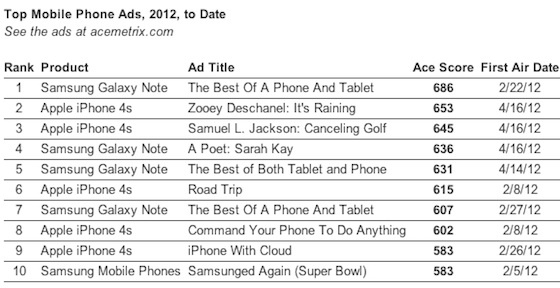 The Galaxy Note and iPhone 4S hold the top nine positions among mobile phone ads released so far this year, with Samsung's "Samsunged Again" Super Bowl commercial directly targeting Apple and iPhone users placing tenth. The new celebrity ads also fell short of Apple's iPhone 4S camera ad from late October, which was named the top mobile phone ad of 2011 with a viewer score of 659. That Samsung Galaxy poet ad numbs my mind. We need to equip a room full of high school students with tablets so they can write collective poetry by hand!? Freaking note pads and pens would work just as well. I'm not saying there aren't good uses for technology in the classroom, but this is not one of them. Is there any place to view all the commercials, including the Samsung ads? I've seen the two Siri ads because they were posted here on MR, but none of the others. And no, I don't watch TV. I'm not one of those "Omg Steve would've never approved these! Apple is doomed!" people though. Yeah, they've been sucking lately. The rock god ad being possibly the worst and annoying advertisement I've ever seen. Although, I don't see what's so great about the note ads. Samsung did in fact win 3 out of top 5, including #1 spot. I like how all the Samsung ads have the same name. Creative bunch aren't they? But regardless of what macrumor forums think (i.e. we're biased) Samsung did in fact win 3 out of top 5, including #1 spot. I would bet their agency is very happy with that result, and apple's is probably not. I actually enjoy the Zooey and Samuel ones. At first I thought they were annoying but they grew on me. I like the ads.....they're typical Apple....and show off Siri.